In our house, we love our cast iron pans! But what do you do if yours get rusty? 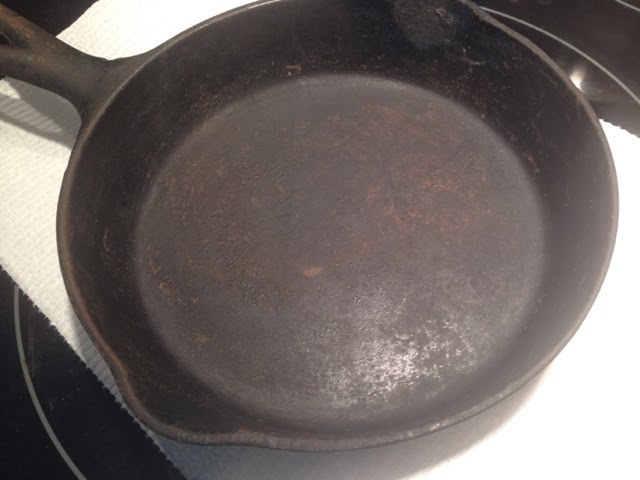 Or you see a beautiful cast iron pan at a tag sale, but it's rusty? Fortunately the rust can be removed with a little bit of elbow grease! The only downside is you will have to completely reseason the pan. 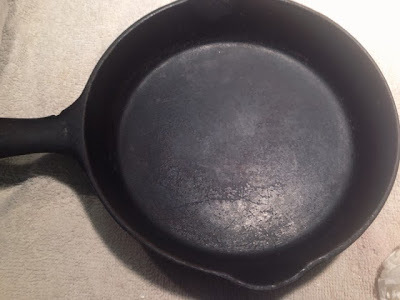 One of the most common ways cast iron gets rusty is when someone soaks the pan in water. 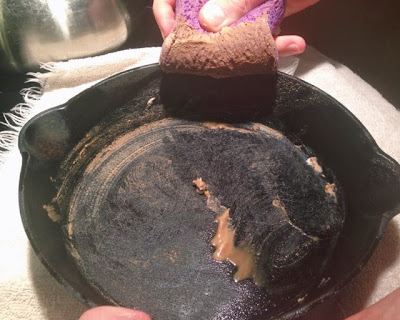 Although that is commonly done with other types of cookware when they are not washed immediately, it is very bad for cast iron! After washing all the dust off you can see all the rust. We had an entire set of cast iron pans in the basement. They had been sitting there for who knows how long. 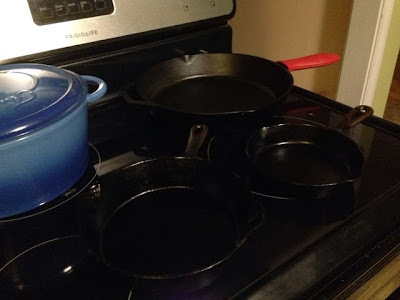 I found them and I was so excited to have pans in every size! 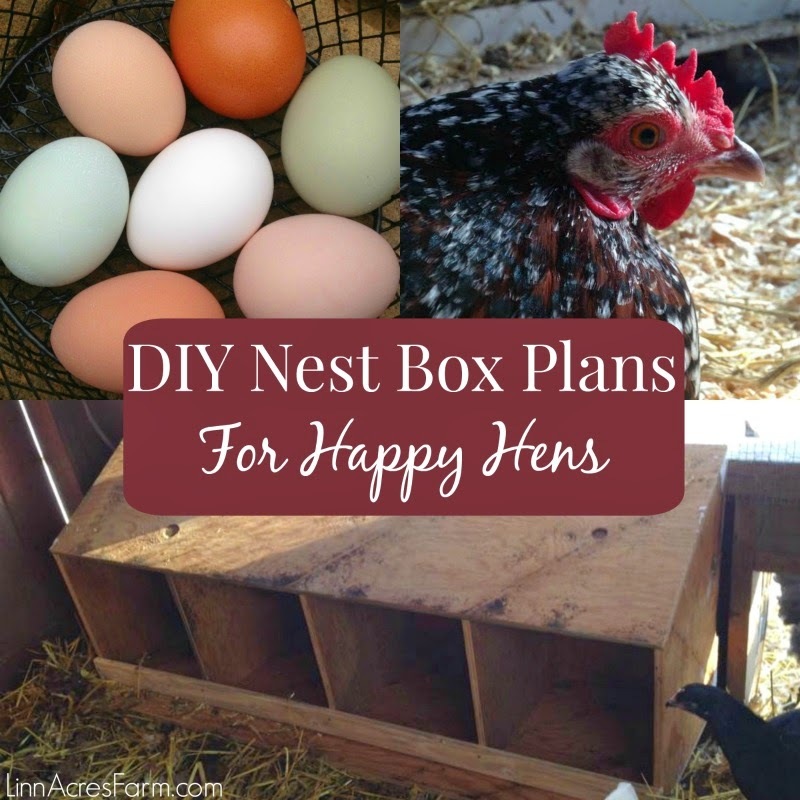 Even that small size perfect for an individual portion of eggs. To start with we washed the pans very well. Since ours were in storage they were covered with a thick layer of dust. We then placed a 50/50 mixture of water and vinegar in the pan and let it soak for an hour. Although we also tried skipping this step and had good results as well. Lots of people recommended scrubbing with some coarse salt. We tried this and it definitely removed rust, but it was taking forever. So instead we switched to scrubbing with baking soda on a sponge. It worked so incredibly well! In the future, we will skip the salt & go straight for the baking soda! Look at all the rust coming off! We kept scrubbing and scrubbing, making sure to get all rusty surfaces. Don't forget to check the bottom, sides and handle! 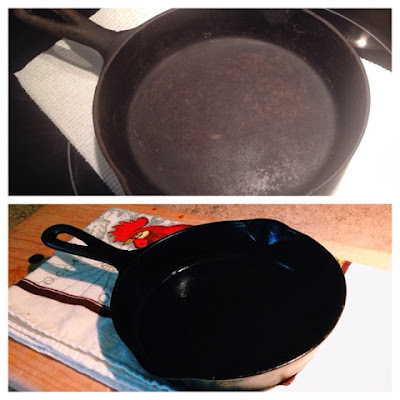 Once it looks like you have removed all the rust, give your pan a wash to remove all the gunk. Dry it and check over all of the pans surfaces to see if there is any rust remaining. We did find some more rust, so we scrubbed again. 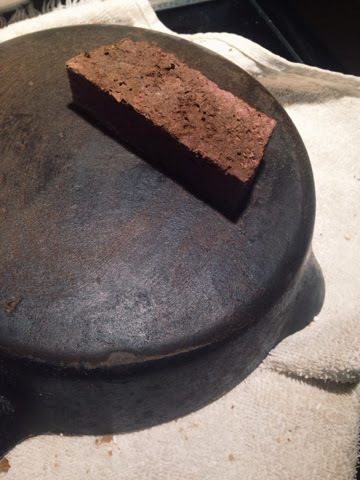 Once we were done the pan was nice and clean again! Still needs a little more scrubbing. 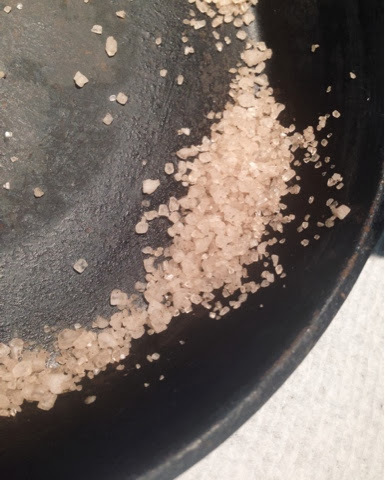 The next step is reseasoning. This can be achieved by applying a very, very thin coating of cooking oil or shortening and baking the cookware for one hour at 350-400 degrees. 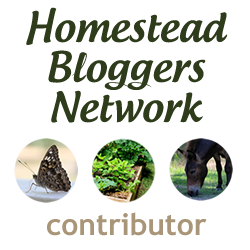 It's very important that you don't use too much oil, since it can cause the surface to become sticky. After an hour, simply shut the oven off and let the pans cool in the oven. The two in the front were previously covered in rust!